The Pro-Democracy, Anti-Corruption Platform is a set of common sense policy solutions that can help put our government on a path to solve problems that affect us all. This is not about Democrat vs. Republican; this is about fixing a broken system, and moving toward a government that’s more transparent, accountable, and responsive to the needs of ALL West Virginians. Several bills have been introduced that advance the goals of the Pro-Democracy, Anti-Corruption Platform. Two of these bills have started to work their way through the legislative process. In the House, the House Judiciary Committee advanced and sent to the floor HB 2008, which would require that a run-off election be held when no candidate receives a majority of votes cast in the nonpartisan election of justices of the Supreme Court of Appeals. The bill was prompted by the results of the November special elections to fill two vacancies on the Supreme Court, where the Governor’s appointees Tim Armstead and Evan Jenkins won with 26% and 36% of the vote respectively in a crowded field of 20 candidates (10 for each seat). Under the proposed bill, if no candidate for a seat on the Supreme Court receives more than 40 percent of the votes cast in the election held for that office in conjunction with the primary election (when judicial elections are now held), a runoff election for that division shall be conducted during the general election. However, the bill failed to address the situation that happened in November, and it has been parked on the House inactive calendar. In addition to bills that are part the Pro-Democracy, Anti-Corruption agenda, we are also monitoring other legislative proposals related to our courts. These include SB 266, which would establish an intermediate court of appeals (ICA). The Senate Judiciary Committee began discussing the bill on Friday, and will resume deliberations on Monday morning. SB 266 would create the first unelected judges in the history of West Virginia, and allow Governor Justice to appoint all the members of the ICA. You can read more about this court packing scheme here. Rather than packing the courts, as part of the Pro-Democracy, Anti-Corruption Platform, we’re asking legislators to strengthen the state’s campaign finance laws, judicial ethics rules, and the state’s public financing program for judicial candidates, which allows judges to avoid relying on large campaign contributions from wealthy donors. SB 266 was approved by the Senate Judiciary Committee on Monday, and sent it on to Finance. 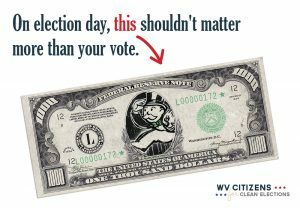 SB 115 – Relating to certain election expenditure disclosures, would require disclosure of dark money political expenditures to allow the public to know who is paying for political advertisements. We deserve to know who is spending money to influence our votes and our elected representatives. SB 118 & HB 2445 – Would end gerrymandering by establishing an Independent Redistricting Commission to propose redistricting plans following the census and make the process of drawing legislative and congressional districts more transparent and impartial. SB 236 – Would provide notice and an opportunity to persons convicted of certain crimes that they are eligible to vote after completion of their punishment. Many people assume the laws have restricted their rights. But that’s not true. While many states have some restriction on felon voting rights, most states, including West Virginia restore the right to vote to people after they complete their sentences – they just don’t know it. SB 276 – Relating to regulation and control of elections defines “foreign national” and prohibits a foreign national from contributing to candidates in West Virginia. The bill also provides an additional penalty for violation of campaign finance disclosure laws, including publishing the names of persons who fail to make timely filings. Additionally, the bill prohibits legislators from fund raising during the legislative session when they should be serving their constituents. SB 429 – Would allow voters who register in person at the office of the County Clerk to register and vote on the same day during the early voting period. SB 438 – Would establish an online voters’ guide on the Secretary of State’s website, where voters could access contact and other information about candidates for statewide, legislative, and judicial offices. SB 491 – Would delay implementation deadline for Automatic Voter Registration (AVR) that occurs in conjunction with getting a driver’s license or state issued ID until July 1, 2020. A delay is needed so that DMV and the Secretary of State’s Office can update their registration systems to make the process more efficient. However, once the proper technology is in place, AVR will make our voter registration system more accurate and secure, while ensuring that all eligible voters are able to participate on Election Day. HB 2008 & SB 108 – Relating to nonpartisan election of justices of the Supreme Court of Appeals, would require that a run-off election be held when no candidate receives a majority of votes cast in the nonpartisan election of justices of the Supreme Court of Appeals.